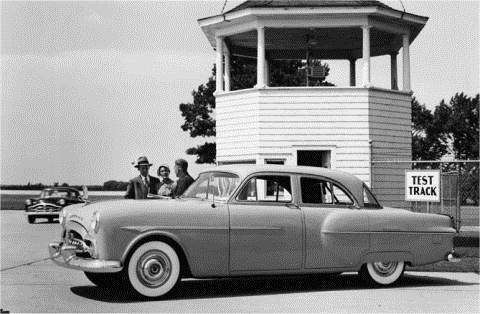 1951 brought a new look to all the Packard that last until 1954. The 1951 models all had a single piece windshield. The grille was a new design also. Packard 300 sedan came has a straight chrome molding running across the rear doors, rear fenders and taillights in a horizontal plane. Standard equipment included all Packard 200 features plus oil bath; air cleaner; tilt-type glare proof rearview mirror; chrome-plated wheel discs; trunk compartment light and robe rail. Double lens tail lamps were used.